Some people find it surprising that the biggest tag on this site is vegetarian. People who know me know that I love big, visit juicy burgers, chorizo (duh), short ribs, lamb and sausage. And while I’m pretty sure I’ll never go vegetarian, I think more than half my meals are meatless. There’s no real reason why I make so many vegetarian dishes, I just like them. Besides, going meatless reduces greenhouse gases and so is good for the environment and good for my health. 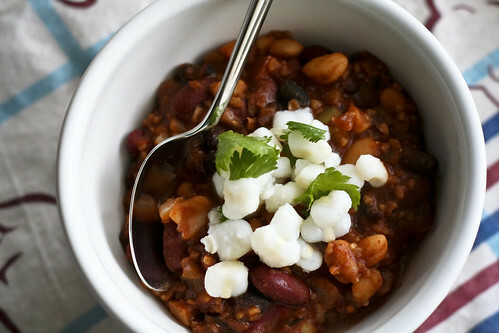 This three-bean chili is warm and hearty and just perfect for lunch. Black, kidney and great northern beans are mixed with fire-roasted tomatoes and green chilies. Bulgur adds a nice texture and masa harina is my secret (not so much anymore) thickening agent. It also gives it a little bit of that cornbread flavor that goes so well with chili powder. My other secret is a bit of smoked paprika, which goes a long way at giving this chili a rounder, meatier flavor. I made a little hominy salsa with lime juice and cilantro to top the chili and brighten the flavors. I also made some jalapeÃ±o cheddar and chickpea muffins, but those were a complete failure and I had to throw them out. Sigh. I hate it when that happens. If you’re making the hominy salsa, stir the ingredients together and set aside. Set a large, heavy-bottomed pot over medium heat and add the olive oil. Once it’s hot, add the onions and peppers and sautee for 5 – 6 minutes, or until the onions start to turn translucent and the edges begin to brown. Add all the other ingredients except for the masa harina and reduce the heat to medium-low. Simmer for 20 minutes, stirring occasionally. Add the masa harina, cook for 5 minutes, then remove from heat. Serve topped with hominy salsa, or cheddar cheese and sour cream or corn tortilla strips. Also great with a nice, crusty piece of bread. Mmm vegetarian chili. This sounds like the perfect meal. I love beans, and the more variety, the better. I’m a meat lover too but for some reason I prefer vegetarian chili. Who knows? Too bad about the muffins, the chickpea sounds interesting. Yum! I love the hominy topping–a beautiful contrast. I love this chili and the topping is beautiful! This recipe looks like I can get all my beans in one sitting, so I’m definitely going to try to make this soon. Thanks!